The Fender Champion 20 is a 20 watt, 8" Solid-State combo amplifier that combines classic Fender tone with lightweight portability. All wrap.. The Fender Champion 20 is a 20 watt, 8" Solid-State combo amplifier that combines classic Fender tone with lightweight portability. All wrapped up in that classic Fender 'Blackface' cosmetic design. The Champion 20 offers a 20w output from a 1x8" Special Design speaker, ideal for practice around the home or spontaneous rehearsals with your band. For late-night jamming sessions, the Champion 20 features a dedicated headphone output so you can't annoy the neighbours, and an Auxiliary input for playing along to your phone or laptop music library. Start out as you mean to go on. If you're new to guitar then you'll want an amp that has a bunch of tones and effects to let you experiment and find your sound, or emulate the sounds of your heroes. Champion 20 comes pre-loaded with an array of Fender clean and overdrive tone presets, and a single-channel input for ease of use. Everything from clean British rock leads to soaring American overdrive, the Champion 20 has got something for every creative moment. The Champion 20 comes pre-loaded with all the effects you'll need to polish and enhance your guitar tone. Reverb, Delay, Echo, Chorus, Tremolo and many more are available at the flick of a switch. A tap-tempo sync feature ensures your atomospheric effects are all in time with your music. For an amp of this size, a good selection of built-in effects bypass the need to rig up a pedalboard - ideal for studio writing and practice before your next gig. 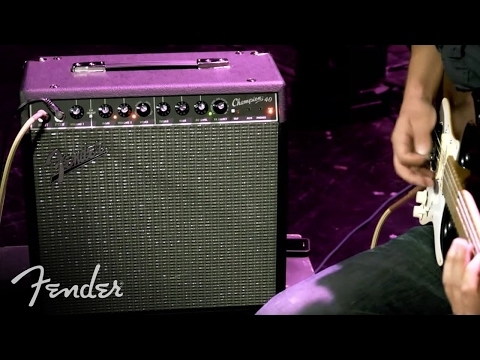 The Champion 100 is the acculmination of over 100 years of amplifier history at the Fender workshop. Paying homage to the iconic Fender 'Blackface' Twin amplifiers, the Champion 20 is finished with a black tolex and Silver grey grille and Vintage-Style Skirted Black Plastic knobs. Not many amps under £100 offer the versatility and value-for-money like the Champion 20! Buy today from the UK's #1 Fender Premier Showcase Dealer - PMT Online.